Sugar Plum Fairy Bark ~ a pretty white peppermint confection bedazzled with sprinkles, because a little bling is always appropriate during the holidays. Put the candy melts in a microwave safe bowl and cook on high for 60 seconds. Stir, and then heat again in 15 second increments, or until the candy becomes smooth and glossy when stirred. Don't over microwave or the candy can seize up. Let the heat of the bowl do the final melting as you stir. Reserve some of the peppermint to scatter on the top of the bark, and stir the rest into the melted candy. 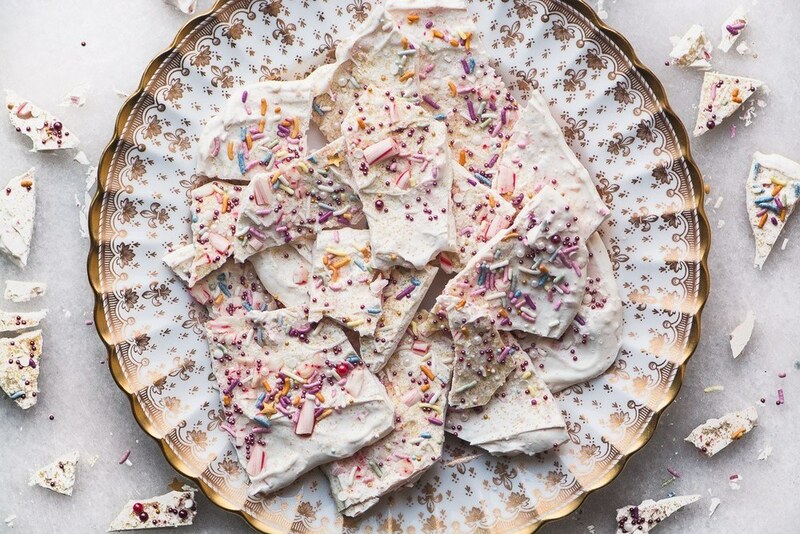 If you are making classic bark, pour out the candy onto the baking sheet and spread out to an even rectangle, somewhere around 9x12 inches, give or take. While the candy is still wet sprinkle on the sprinkles. Let harden at room temperature for a few hours, or put in the fridge to speed things up, then break or cut into pieces.